Only 23% of the organizations in the world today have an effective Big Data strategy in place. From the time you wake up, to the time you go back to bed – everything you do online is stored and tracked in the form of data. If you use Kindle for reading books, it generates data about which books you are reading, the time it took you to read them, your start and end times, and so on. Similarly, listening to music on Spotify generates data about your music taste. Oh, and have you heard about the Snapmap and the Snapchat Bitmoji? They’re Snapchat’s latest features, and they take stalking to a whole new level (we’re not even kidding). Bitmojis are highly customizable user-avatars which are displayed on the Snapmap, depending on your GPS location. What that essentially means is that people in your friend list can quite literally track your movements and activities, and all in real time. Not only Snapchat, but there are also many other apps which continuously monitor details like where you are, how fast you’re moving, and which apps you’re using and so on. These details, like every other detail in the digital world, are stored in the form of data. And, there’s no limit to this data – it keeps stacking up, increasing the overall data in the world today. This data is what is known as Big Data. While volume deals with the sheer amount of data in the world, Variety talks about the multitude of sources this data comes from. This big data is largely unstructured, and that is because it is obtained from various sources in varying formats – from audios to videos, text documents to GPS locations, and so on. The third characteristic – velocity, talks about how rapidly this data is being generated. This data, being unstructured, is highly unpredictable and uncertain without proper analytics. Veracity talks about precisely this uncertainty. These four pillars, although not sufficient to thoroughly explain the term “Big Data”, do a fair job of giving an idea of what Big Data is. These four characteristics are also what makes Big Data so mischievous and challenging to deal with. If you’re someone with a flair for data, this is your time to rise and shine. Get armed, and tame the beast that is Big Data. There are plenty Big Data certifications available to polish. And, in all honesty, there was never a better time for getting hands-on with Big Data and Analytics than now. In today’s world, every organization, big or small, has taken the online route. As a result of which, they have tremendous amounts of data on their customers and their activities. This feat, however amazing, is useless unless these organizations have the brains required to get insights out of the tonnes of data. According to a report released by the guys at IBM, only 23% of the organizations in the world today have an effective Big Data strategy in place. All of this just goes to show that there is a significant shortage of efficient data professionals in the world today. So much so that it has quickly become one of the most handsomely paid professions in the world. 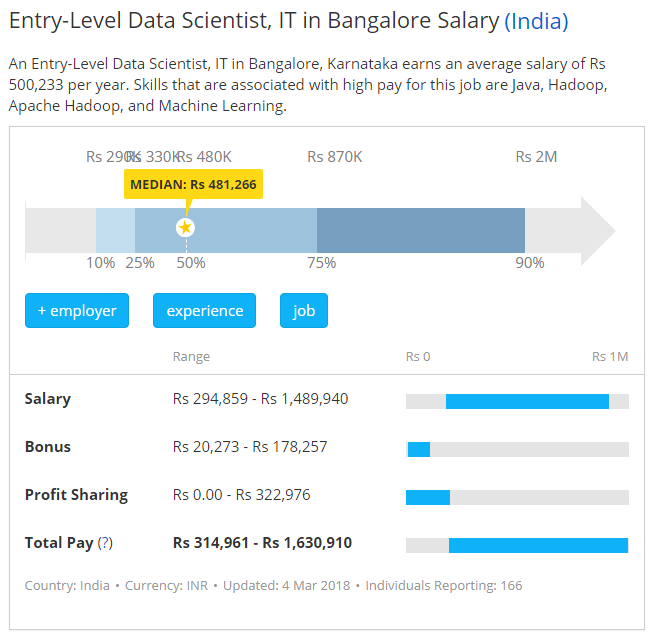 The image below shows the median salary for entry-level data professionals in Bangalore. Compare it with salaries of other entry-level jobs, and you’ll realize that data analytics has good money – even for an entry-level job. Moreover, Big Data is something most of the organizations are looking to leverage, and as a result, they’re looking to get the best person on-board. Because of this, the salaries, even for entry-level professionals, can sometimes soar up to 10 LPA or more. Although this depends on your skillset and the role you’ve applied for. If you fit their bill and can prove your competence, there is no chance an organization will not spend extra to keep you on-board. Depending on what an organization does, they’ll more often than not require skilled professionals for most of these roles. This is where you come in. Now is the time to explore the terms listed above – go crazy in-depth, and find out your fit. Once found, start gearing yourself up by mastering the latest technologies and skills needed to succeed in the field of your choosing. Big Data is the way forward, and it’s up to you to make that count! About the Author: This article is contributed by Vivek Kumar – President, Consumer Revenue at UpGrad. "Big Data: The Next Big Thing For A Successful Career! ", 5 out of 5 based on 3 ratings.